This is another of my new Woodware Clear Stamps - A Gerbera Flower. I used a Wild Honey Ranger Distress Ink, to distress a piece of cream card. 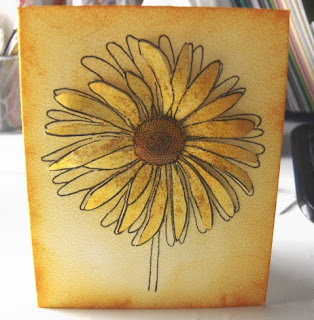 (This was my first ever attempt at distressing) Then I stamped two gerbera images onto the card and cut one of the images out. I removed a few of the petals and then gently bent the petals back to give a bit of depth, The second image was then attached to the first using 3d foam, and the centre of the flower was filled in with glossy accents. A light dusting of gold glitter was added to the petals and hey presto I had a Gerbera! I plan to make lots more of these flowers in bright colours and then use them to make a card - I will post a piccie once I have made it!